This iPod interface will allow you to connect your iPod iPhone to your factory Chevrolet GM stereo system. The sound is CD crystal clear, and while using this adapter you can control the songs and volume using the buttons on the Chevrolet GM radio, or on the steering wheel. Don't be locked out of your iPod by other adapters, this adapter allows you to use the iPod wheel to navigate through your entire music collection. The iPod adapter will also power and charge the iPod while in use, all from the same cable. 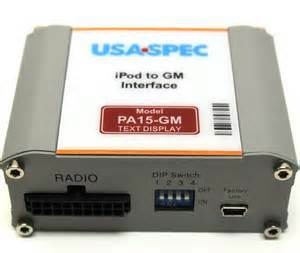 Chevrolet radios with satellite controls (band button) will display iPod text on radio screen. All you see is one single cable plugging into the bottom of the iPod. Arrive at your destination in style, and with a full iPod battery too! If using and iPhone you can also stream music from internet services like Pandora Internet radio, Livio radio , i-Heart radio or online XM Sirius satellite radio PA15-GM. Plug your iPod iPhone to your GM Chevrolet radio. Control using the iPod, Factory GM radio, and steering wheel controls. Powers and Charges the iPod 12v and 5 volts USB. Chevrolet GM vehicles have a connection for external CD-changer or XM radio. This adapter connects at that connection and allows the radio to recognize the iPod like a CD-changer or XM radio. This is not a FM transmitter! Directly connecting your iPod is the only way to get that digital quality sound that you desire. (*Some vehicles have CD-changer connection in glove box or armrest.) All of the necessary cables are included, just plug it in and you are set to go. 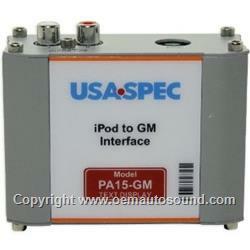 If you have XM radio there is no need to remove the factory radio, the iPod interface can be plug at the XM tuner. XM1 will be XM and XM2 will be the iPod/iPhone. 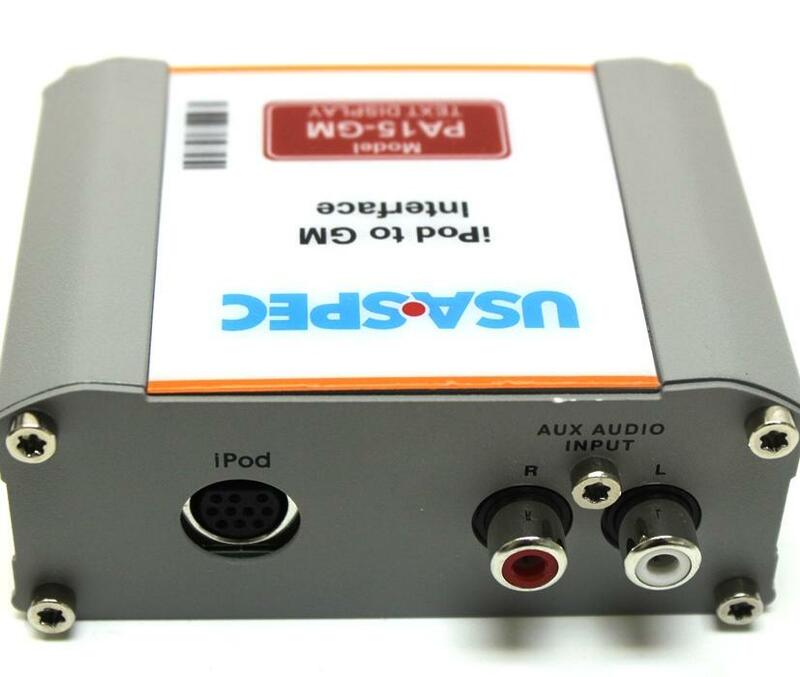 The iPod adapter comes with the correct plug to simply plug the adapter into the CD-changer or XM connector behind the radio, (if there is no XM tuner in the vehicle.) There is no cutting or splicing of wires necessary. Includes installation cables, mounting screws and user's manual. If there is no XM tuner in the vehicle. Plus DVD player, satellite radio or other audio device can be used in conjunction with the iPod through aux audio input jack. Connect, Control, Charge, and Play an iPod/iPhone through your Factory Radio. 3 Plug-and-Play Harnesses for easy installation. Factory Radio operates the iPod just like a CD-changer or XM. **new RD's radios with CD-changer control. ***only work with AM/FM/ and Mp3 Player. For easy access to Direct Mode Just select preset 5 or 6 for direct mode and then select PANDORA, LIVIO, or SIRIUS XM right from your iPod. LIVIO – Choose Direct Mode, select your LIVIO iPhone app, and pick your radio station! The radio or steering wheel controls skip through to next saved radio station. Works with radios that have satellite radio, In-Dash 6 disc changers, Mp3 Player, Navigation Units, and Rear seat Entertainment.